Don’t wait for stories to appear in the store when you can become a member of Wheelbase Media’s weekly news service and save more than 50 percent while gaining instant access to the new features as they’re produced. Click here to get started.If you are not a member of the media, but still wish to check out some of our stories online, visit www.theoctanelounge.com, which is owned by Wheelbase Media. Use: Interactive content for media professionals looking to bolster recurring readership and increase the amount of exposure time for their products, whether print or Web. What it is: Why are auto publications so dry and so serious? We’re living proof that car nuts have a sense of humor and want to have a little sugar on their Corn Flakes. Your readers will have fun with the “Driver ’s Seat” Word Search as they unearth people, places and events. Driver ’s Seat is just one step in making your auto product more interactive, which provides more exposure for advertisers and more revenue for all. Due to the highly complicated graphic nature of this product, we do not yet offer a version that can be played online. 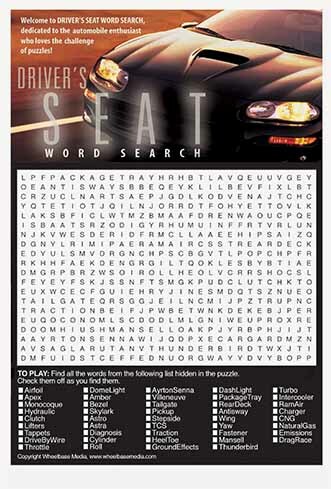 Instead, visitors to your Web site can print out the crossword and play it at their leisure. Vote yes to having a playable online verion by clicking here. High-resolution 300 dpi jpg CMYK file suitable for print and Web.